To provide the best quality medical care to our patients through our medical attention and network of services or specialist referral. 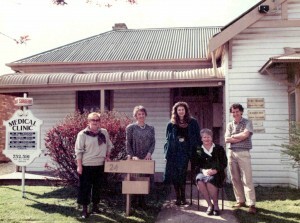 Central General Practice opened its doors in 1981 at 24 Highett St with one doctor, Dr Ross Gilham, and a receptionist/nurse, Pat Webb. 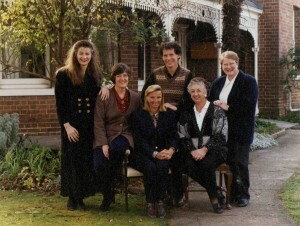 Marg Elliott joined the reception staff soon afterwards. The Practice was purchased in 1987 by Will Twycross and Kerrie Davis, and continued to expand. In 1989 it moved from its original premises to one of Mansfield’s best locations, a Federation period double brick home opposite the sports ground and Council buildings, half way between the main street and the hospital. It has grown through two major renovations and the addition of a whole new wing, and now employs fifteen staff. The practice has also for many years provided medical services to outlying clinics at Jamieson, Bonnie Doon, Geelong Grammar’s Timbertop Campus, and Mt Buller. Current and past doctors have all been Visiting Medical Officers at the Mansfield District Hospital, where for over thirty years they have provided inpatient and outpatient (emergency) care, as well as Obstetrics and Anaesthetics. The Practice is accredited with both Bogong Regional Training Network and the University of Melbourne to train both registrars and medical students in general practice. We are an AGPAL Accredited General Practice and our standards are set by the Royal Australian College of General Practitioners. Accreditation is a process which acknowledges that our surgery has met these set of standards. It shows that we are committed to safe, high quality health care. Accreditation means you are being cared for in a safe place. It is a voluntary process undertaken and is renewed every three years. Visiting an Australian Practice Accreditation Limited (AGPAL) accredited practice means that we, as an accredited practice, have met medical and industry standards. The Practice through the ages.